This cross stitch stamped sampler displays a stunning group of antique motifs printed on natural European linen.This is a larger stitch stamped sampler designed to encourage first time sewers to an enduring American craft.This sampler is a 9x12 design. 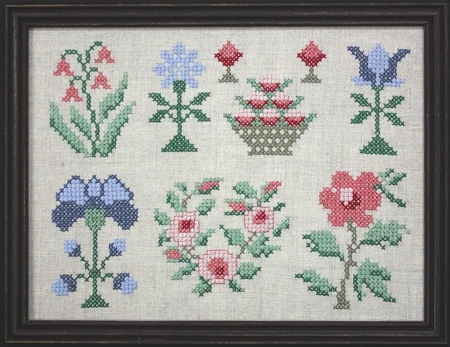 Beautiful colors grace each motif as the larger cross stitch is an enticement to become active in cross stitching. I love this kit although I haven't started it yet!